Founded in 1962, the TPC Company (Thai Pineapple Canning) was the first pineapple cannery to start operations in Thailand. In 2010, TPC consolidated with SAICO ( Siam Agro Industry Pineapple and others ). Operations are now running under the SAICO label with TPC as a holding company. 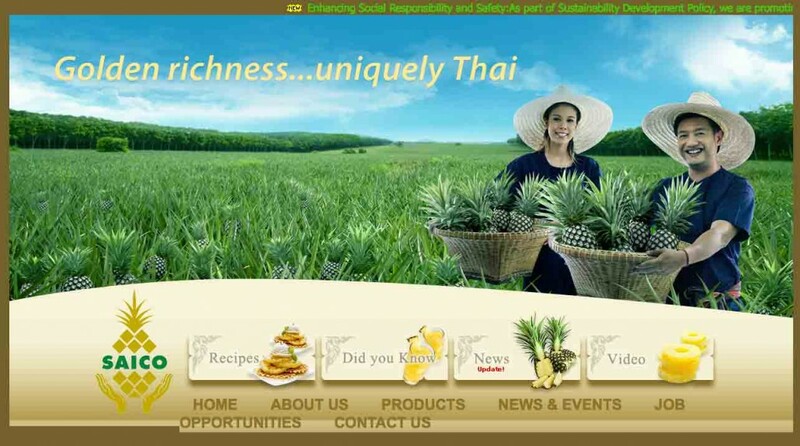 The merger of the 2 companies created the nr 4 pineapple cannery worldwide, and the largest in Thailand. JAFFAFRUIT and SAICO have been in business since 1990, whereby JAFFAFRUIT distributes SAICO’s pineapple juice concentrates in large parts of Europe , providing excellence in service to SAICO’s customers. Our main products are frozen and aseptic 60 and 65 brix pineapple juice concentrate. SAICO (both factories) is a member of SGF and pursues an active policy of quality and safety optimization as well as environmental responsibility in the largest sense. All quality documents are available on request.